Luxury 2 bedroom log cabin with hot tub. Nestled in a quiet corner of the old orchard surrounded by extensive lawns, child and dog friendly. Suitable for limited mobility with a ramp to the back door and all accommodation on one level. Scandinavian log burner in the lounge area, making it a perfect romantic retreat with the log burner and hot tub. We had an amazing time staying at the cabin (our friends stayed too at the barn). We loved the hot tub and tennis and the kids loved the games room. The facilities were great and the attention to detail was spot on. We loved it and hope to stay again. Thank you for having us. Great place for a relaxing few days away nice rural setting, comfy beds and all the amenities you need. Highly recommended will be back again. We had a lovely time staying at The Hop Pickers Cabin, the cabin is very well equipped and had everything we needed. We enjoyed using the log burner and the hot tub and found the cabin to be the perfect place to relax and unwind. Very dog friendly and lots of walks nearby. We particularly enjoyed the local pub The Bear and Ragged Staff. We would love to stay again in the summer to be able to make use of the pool. Everything about this stay was outstanding. The cabin was clean, had everything we needed. Fresh bread was left along with apple juice, eggs, tea, coffee etc. The hot tub was lush and the favourite bit of our trip, sitting in their at night was so peaceful, you couldn’t hear a thing. Definitely returning at some point, nothing bad to say AT ALL! Really private accommodation, great hospitality and a really warm welcome. Fresh farm eggs, bread and milk were waiting for us which we really enjoyed for breakfast. A great size for 4 people with lots of space to relax. The hot tub is a great addition and we made the most of it (even in Feb!) and the log burner and lovely fluffy robes in the wardrobe provided the ultimate coziness. Location is great if you have your own transport, the Malvern Hills, villages and supermarkets are within a short drive. Would definitely return and recommend to others. Thank you for a lovely stay. Really nice cabin. It is equiped with everything you need and the hot tub is excelent. The location is ideal for a romantic holiday. We’ve found a little piece of beautiful! Log burner and hot tub unbeatable. We arrived on Sunday afternoon after checking out a local pub for an evening meal. The cabin was very clean and well furnished. The location is quiet to say the least. No street lights, no cars going by, nothing but peace and quiet. Owners are friendly and accommodating. Little slice of peace and quiet in a beautiful setting. We will be returning. Local amenities are rural so doing a bit of research will enhance your stay. Saying that it was so comfortable we only left for food. Loved our stay. An amazing stay at Hoppickers Cabin. The accommodation was exceptionally clean and to a high standard throughout, it's kitted out with everything you could need! The owners were very friendly and considerate and we appreciated the little touches such as fresh eggs, bread and milk (plus biscuits and locally made marmalade) left for us on arrival. It was wonderful to relax in the hot tub in the evening or sit by the fire. The cabin felt very private and sits in lovely countryside surroundings with plenty of places to explore. A perfect girls weekend away. A friendly welcome to a beautiful property and some lovely thoughtful essentials left ready for us (Milk/bread/eggs and some homemade conserves and apple juice). The property has everything you could possibly need. It’s set in the most beautiful plot and the log burner and hot tub were the perfect accessories for a relaxed weekend with friends. It has lots of lovely ameneties near by and a short drive to the beautiful Worcester. We really enjoyed our stay, the owners were welcoming and very helpful. The hot tub was lovely and it was nice to relax in it and enjoy the surrounding areas. The only thing that let it down was the cleanliness. There were a lot of cobwebs and a thick layer of mold on the shower runners. There was also a very unpleasant smell in the evenings which was difficult to block out. However the bed was possibly the most comfortable bed I have ever slept in. We really enjoyed our stay! 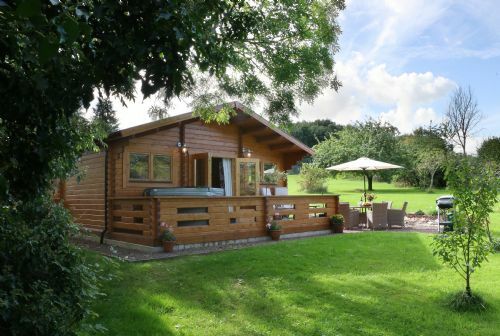 The Hop Pickers Cabin is in an idyllic location, but only a short drive to nearby towns. A very well equipped cabin with all the comforts of home, a great hot tub and bbq/outdoor seating area. Our host was very welcoming and friendly. We had a wonderful time and would definitely return again. Highly recommended. Set in a lovely peaceful place with plenty of interesting things to do this is a great place to stay. The hosts are friendly and professional and ensure everything is spot on. Sitting in the hot tub under the stars with a cold drink is so relaxing. Highly recommended place to stay and a games room that is a fun place to spend a few hours in. Our family of 4 from Canada had a wonderful stay at Hop Pickers Cabin. The cabin was very clean & comfortable. We did many day trips from the cabin (hiking the Malvern Hills, visiting the Cotswolds, theatre in Stratford-upon-Avon, Eastnor Castle, cycling in Wyre Forest) and it was always relaxing to come back to the cabin in the evening and enjoy the hot tub, pool and spend time together there. I very much recommend it to others looking for a quiet peaceful place to stay. This is our 4th year of staying at Hoppickers Rural Retreats - and we have re-booked for next year. Perfect for total relaxation, access to plenty of lovely walks and wildlife. Very dog friendly. Louise and her family always make us feel so welcome. Access to the swimming pool is such a treat - especially during the glorious weather we have been experiencing. Plenty of excellent places to eat and the local produce is superb. The cabin is ideal and always spotlessly clean. Roll on next year! We had a wonderful week at The Cabin, everything we needed was there, the bed was comfy, and we had a lovely lazy time and went home thoroughly relaxed. We were given plenty of information about places to shop, eat and visit all of which were in a fairly local area. Although we were not far from the owners house it felt like we were alone in the middle of the countryside and it felt very private. We had a lovely week at hoickers rural retreat , the cabin was lovely everything you need for a lovely quiet holiday, plenty for the kids to do, tennis , games room swimming pool, our daughter loved seeing the horses and for the parents a relaxing hot tub , we really enjoyed our stay and would recommend it to family and friends . The swimming pool, tennis court and games rooms are a real bonus for the children. The cabin was in superb condition, all the little touches made it superior to other cabin holidays we've been on. Games and books for the children. Everything was of high quality and all you need in the kitchen. The beds were really comfortable and with it being so peaceful, we all slept brilliantly. The privacy you get here is what makes this place really special - huge garden for the children and dog to play on and complete privacy whilst using the hot tub . The family who own this place were really friendly and had so much time to spend with the children whilst they handled little ducklings, chickens and their pony, answering any questions the children had. It is in a beautiful location and ideal to the Malvern Hills for a lovely walk and great food at the Bear and Ragged Staff near by. We don't normally return to a place, but we will be returning here - it's a little gem! Fabulous time had by all the family including the dog. Perfect location. Louise & David are very helpful & perfect hosts. Thank you for opening this fabulous corner of Worcestershire up to guests so we too can experience the beauty. We thoroughly enjoyed our stay in this delightful cabin with greenery and birdsong around it. The facilities provided all we needed. The Hoppickers cabin was absolutely perfect for a weekend stay for four friends and one well behaved dog. The Cabin has everything you could need for a comfortable stay, and the hot tub is an added bonus! Lots of nice walks nearby and a peaceful, relaxing retreat. Lovely little cabin on a rural farm. If you are looking to get away and enjoy a weekend in the country side this would be a good place to stay. Very cosy inside, private hot tub outside and a very cheeky (but cute) Labrador that will steal all your inflatable drinks holders when you are not looking. A fantastic Cabin that is very well stocked, we visited for a girls weekend and made full use of the lovely hot tub! And visited the Malvern hills on the way home. We had a lovely time in the Hop Picker's cabin. It was tastefully decorated, in a peaceful location yet not too far from places of interest. There were a couple of minor issues but Louise was quick to address these. We did get up early to use the hot tub on our last day as this was advertised as being able to be used at 7 but Louise later confirmed this was 8am so I would recommend you check the hours of use. All in all, a lovely time was had at Hop Pickers and I would like to return in the future. Perfect for a quiet weekend. A weekend away with my friend sans husbands and kids-what a perfect retreat. Peace and quiet and all the facilities needed to make our stay exactly what we needed. My boyfriend and I enjoyed a lovely short stay between Christmas and new year. The cabin is beautiful and the log burning is a fantastic touch. Loved the hot tub. So relaxing! Very beautiful surroundings and so peaceful. Played tennis and went in the games room which is a nice added touch giving you things to do during your stay. Cabin has everything you need including cooking equipment, games, blankets and even some local produce on arrival. Felt very welcome and the customer service was fab. Owners have a lovely dog who comes by to visit and he’s very friendly and playful. Best place to recharge your batteries and I can’t wait to go back! Words are not enough to describe the absolutely wonderful weekend we had! My husband and I, along with our friends (another couple) and our two little dogs decided to have a pre-Christmas weekend break, and picking Hoppickers Cabin was the best thing we did! From the moment we stepped inside the cabin, we were blown away by how incredibly beautiful it was - from the lighting to the décor, everything was perfect! The welcome food package was an unexpected, but very nice gesture. There was a gorgeous log burner in the living area, which heated the place up very quickly and added to the already cosy atmosphere! Given it was so cold outside, this was a very welcome feature! The kitchen was well stocked with spices and other necessities for our meals, which we had great fun preparing together. Both bedrooms were very comfortable and had private doors which opened directly on to the lawn. While we loved everything inside the cabin, the private hot tub outside was, without doubt, the highlight of our weekend! The four of us spent many hours both nights of our stay sitting in the bubbling hot water and chatting under the stars - a truly memorable experience! On the final day of our visit, we had a lovely walk around the farm and visited the horses and hens. We even managed to pick a few apples from the tree next to the cabin! We travel a fair bit and have had the pleasure of staying in some great places over the years, but the cabin was definitely one of the loveliest to date and we very much look forward to returning in the (hopefully) near future! We only had 2 nights to get away and recharge the batteries before getting back on the hamster wheel of life... but this was a fabulous and refreshing retreat. The cabin is just right. Feels luxurious and yet homely. The hot tub under the stars was stellar! Louise was helpful and friendly, and very forgiving when I forgot to ask for robes, with 2 extra found at the last minute. The generous and welcoming extras of fresh eggs and fresh baked bread set the tone. And the bottle of fresh pressed apple juice from the farm went perfectly with the bison grass vodka we brought with us! I would recommend the Hoppickers rural retreats to anyone looking for a special getaway with family, friends or lovers! Loved the cabin. What a bit of luxury having a hot tub too! Nice little welcome pack, great information folder and the opportunity to spot badgers. We will be back. We stayed for a long weekend in the cabin during September and had a lovely time. We were given a very warm welcome and quickly made ourselves at home. The cabin is fitted to a high standard and the location feels secluded and peaceful. Our toddler loved exploring the site and being given the chance to meet the owners dogs, chickens and horses. We would definitely recommend it to others. We needed somewhere with disability access and a wet room but this was so much more. We had everything we needed for a comfortable stay. We were able to visit the Morgan Motor Factory[as an 80th birthday celebration]. Loved wandering the grounds and exploring the area on foot. Plenty of good eateries nearby. Would love to come again. Four friends getting together for an escape. Great place (though slightly tricky to find for some!) which although reasonably close to house and other buildings felt like we were in the middle of nowhere. The accommodation was really luxurious. The beds very comfy, bathroom clean, kitchen fully stocked (though some pint glasses would have been handy), and hot tub was the icing on the cake. We will definitely try and book again in the future. Had a lovely relaxing weekend at the hop pickers cabin. The cabins location is really peaceful. The cabin is great, with all the amenities you could need. Hot tub is brill - although it was a little chilly getting in and out but once in was very relaxing! Would be nice to have some fluffy bathrobes to use for getting in and out. Would fully recommend, Louise was more than welcoming. Great location with lots of walking on the doorstep as well as the brilliant views and walking in Great Malvern. We will be returning. 2 dogs and 11 month old were fully catered for as well. This is our third year of staying at Hop Pickers Cabin and we love it - and have booked again for next year. Lovely peaceful setting, walks, countryside, exceptional food and drink nearby - especially from Go Gourmet and Roots; pubs close by. Perfect for that getaway holiday and our dogs love it! Plenty to do and see in the surrounding areas. Louise and her family (and their dogs, Oscar, Twiglet and Henry) do a great job in looking after you and we always feel welcome. The swimming pool, tennis court and Table Tennis are a bonus! Roll on 2018! Everything I could've hoped for...and more! I booked a short stay over bank holiday weekend at Hop Pickers Cabin for my partners birthday, as the photos looked great and I was looking for something that meant we could escape the hustle and bustle of urban life. I could not have asked for anything more. The cabin is so perfectly equipped and has everything you need to have a comfortable stay. I was particularly impressed with how sophisticated the kitchen was and I really enjoyed cooking both in the kitchen and on the BBQ during our stay. We spent an evening in the hot tub watching the sun go down and it was truly special. It's also right on the doorstep of the Malvern Hills, and we enjoyed a long walk up there. The grounds are beautiful and the hosts are very attentive without being intrusive. I would whole-heartedly recommend this place and will definitely be back! We stayed in the cabin for a weekend in May. The weather wasn't perfect but the cabin was. It was beautiful inside, very clean and had everything you need for a self catering holiday. The hot tub was amazing and we all enjoyed it in the evenings watching the sun setting. The games room was great, something for everyone the girls loved going in there to play with the scalectrix, darts and table tennis, great family time together. Louise was the perfect host too. Highly recommended and we will be returning I'm sure of that. The combination of a peaceful location and comfortable accommodation with the added luxury of a hot tub made this a memorable holiday. Thanks to the owners for their help. Happy to recommend this place. Spent a wonderful post Easter break at the Hop Pickers cabin and came home feeling relaxed and refreshed. The cabin is situated in a peaceful location but closely linked to major road routes making it easily accessible. The cabin was well furnished and had all the amenities required for a relaxing break. We didn't use the wood burner because we had excellent weather but it looked a welcome addition for a cold winter evening. The hot tub was put to full use and we spent peaceful evenings under the stars. Great walks straight from the door and owners on hand with good recommendations and advice. We hope to return. Brilliant couple of days will definatly be returning! We arrived early but were allowed in as the cabin had already been cleaned, it was spotless and very cosy. Louise showed us round and explained how everything worked and helped us out during our entire stay with walking routes for the dog. We were provided with bread, fresh eggs and milk which was lovely as the closest shop is quite far. The grounds are perfect for a dog and he was allowed to roam around and play with all the other dogs which was lovely. The cabin had everything we would possibly need, and more! Lovely walk through country paths to a quaint dog friendly pub takes about an hour but is well worth the walk for the food. Malvern hills is about a 15 minute drive so the cabin is perfectly situated. Excellent accommodation with good facilities. Hot tub was a great addition to a quiet and peaceful holiday, perfect place to relax and unwind. Had a great stay. The place was very well kept. Enjoyed the hot tub. Lovely part of the UK to go for long walks. We had a lovely stay in the cabin. Louise was welcoming and informative. The cabin itself had everything we needed and the beds were extremely comfortable. I'd love to visit again in the winter months for a cosy break. The Hop Pickers Cabin is a special and unique place to stay. It's private, spacious and comfortable, and is a wonderful place to unwind and relax. I only wish we could have stayed for longer, and will definitely be returning.